KATU’s Afternoon Live Host Tra’Renee Chambers and I examine the benefits of ditching the things weighing you down. Sherri Curley, aka The Practical Sort, is a home organizer, speaker, and organization motivator. 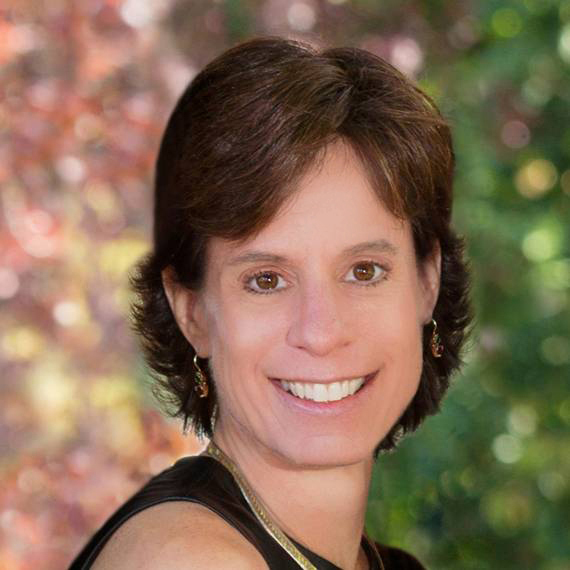 She adores working with clients to help them simplify life through personalized, practical, eco-friendly solutions. She crafts weekly productivity and time saving tips at ThePracticalSort.com. She also hosts a monthly blog, along with podcasts, videos, and community workshops. To schedule your free home organizing phone consult, contact sherri@thepracticalsort.com or ThePracticalSort.com. Frustration, overwhelm, and tension caused by excess stuff or inefficiency no longer needs to be part of your story. We are all crazy busy and seeking practical solutions for getting our sh*t together. There are loads of books and other resources to teach you how to get organized. They’re great. But you can read about getting organized until your eyes cross and your brain is ready to explode. Let’s get real. Unless you take action, the piles won’t disappear, the boxes that haven’t been opened since you moved in 20 years ago will never get unpacked, and old, worn-out clothes will continue to occupy much needed closet space. Let’s get you unstuck and moving forward in a natural direction. The sooner we start, the quicker you will create the home your crave and make room for what matters to you most. Contact me at ThePracticalSort.com or sherri@thepracticalsort.com, and we’ll begin sorting through your unique challenges to find solutions that work for you. For over 20 years, I assisted non-profits, family members, and friends to create systems and routines to simplify life, provided guidance on what to keep and what to release in an eco-friendly way, and arranged spaces and items to work better for them. As I transitioned into a "Freebird" sending my last child off to college, I launched The Practical Sort to focus on providing practical, organizing solutions for busy women. Prior to having children, I worked at the Environmental Protection Agency (EPA) during the early days of grass roots recycling. Reduce, Reuse, Recycle, Repurpose, and Reimagine are goals of every Practical Sort organizing session. If you are not lovin' your home so much, if you are struggling to “get it together”, if you’re thinking “if I only had an extra set of eyes, ears, hands, and perspective to get me started”, then reach out to sherri@thepracticalsort.com or request a free phone consultation by clicking here. The longer you wait the harder it is. Let’s LOVE our homes, let’s simplify our lives. Looking for a speaker to share organizing secrets? “The workshop was AMAZING. Really. I bet most of us are still processing as we got home and interacted with our “stuff”.. now my 15 year old is on fire with her recycling passions. “Thank you so much for a fun workshop and presentation. The attendees seemed to love it and I heard great feedback. Thank you again for supporting our group and our mission to support moms juggling their work and home lives." 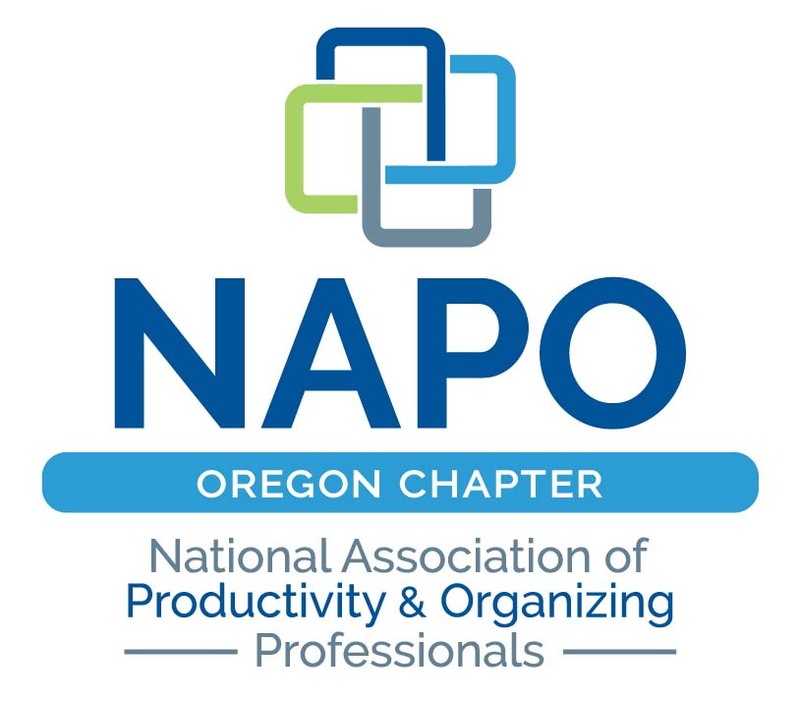 Each quarter, the National Association of Productivity and Organizing Professionals (NAPO) Awards & Recognition Committee selects a member to feature here on the Get Organized & Be Productive blog. 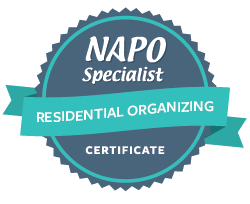 This regular blog introduces a few NAPO members and to see the value of their NAPO experience in a more informal way. 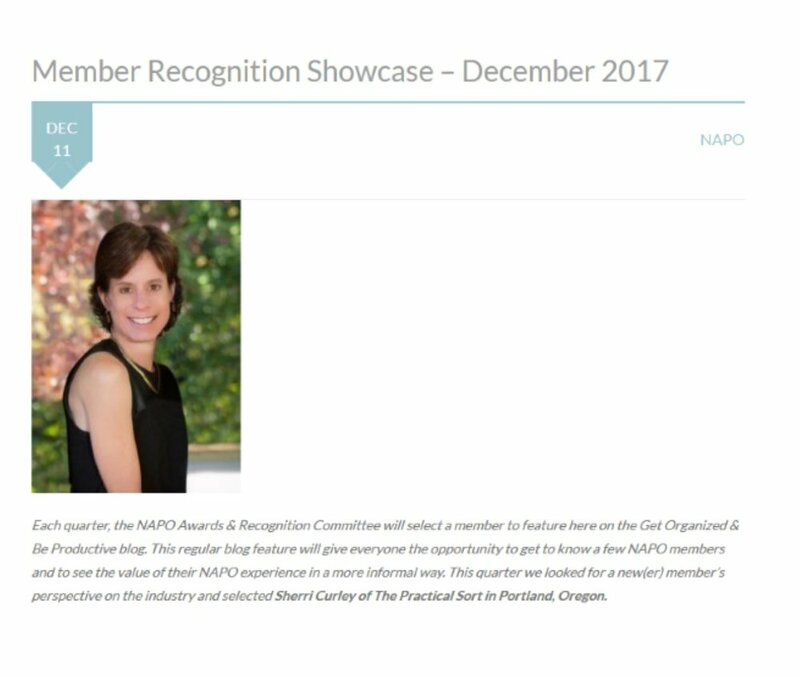 I was so honored to be selected in December 2017. If you would like to get to know me better to see if we might be a good fit, read the blog here.